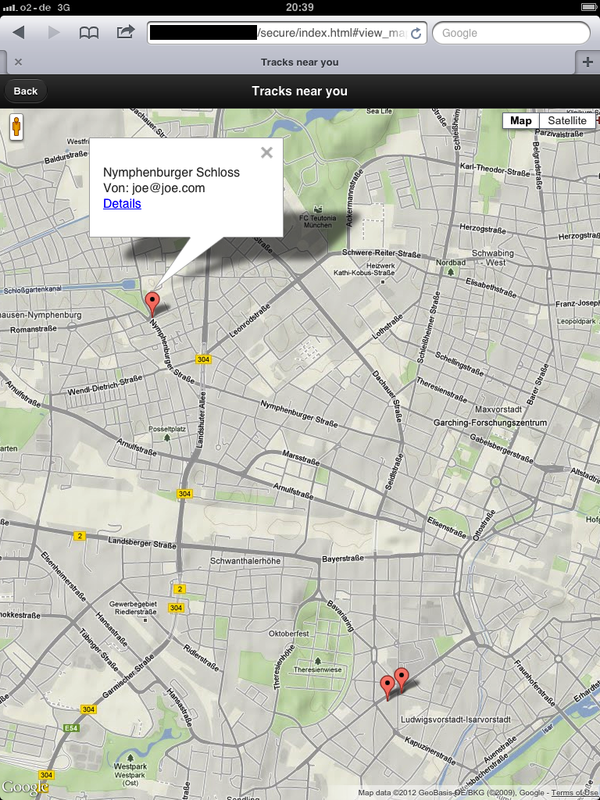 Our application stores track informations about tracks an user has recorded with a GPS tracking device. For simplification we assume that the tracking data exists in a JSON format. This document is stored in the MongoDB with the additional information about the user who uploaded the track and an additional attribute about the position where the track starts. With that track information stored in the MongoDB we start a search, that includes all tracks with startpositions within a certain radius. These Tracks are shown on a map. If you have not installed MongoDB yet, download the latest version and install and start it. Now we have to start the interactive mongo shell. In the console you type following commands shown in Listing 1 to use the track collection and create a mongo spatial index. Listing 1: The command to creaet a MongoDB spatial index. Now you can use the MongoDB spaitial feature. 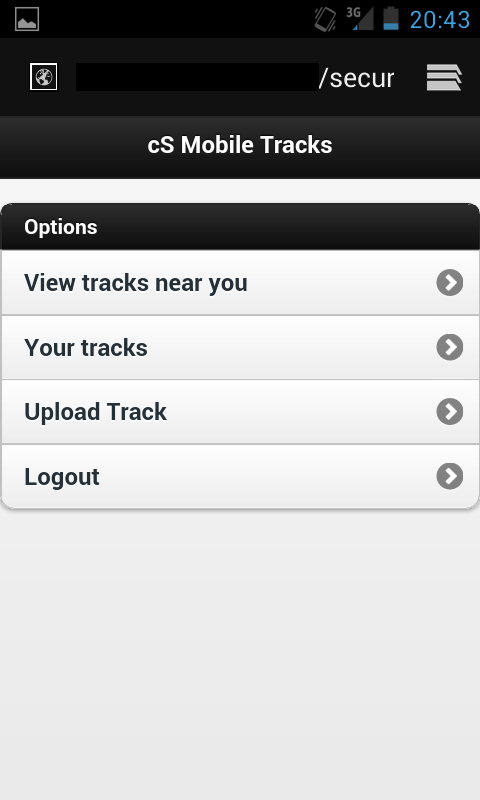 For example you can execute the command in Listing 2 to find the tracks with a nearby search to a given point. Listing 2: Find the two nearst tracks to the given point with the latitude and longitude. Or you can execute the command in Listing 3 to find the tracks with a nearby search to a given point with a maximum distance. In the example we search in a distance of 1 kilometer. Therefore we have to divide the value 1 by 111 to get a maximum distance of 1 kilometer. For 1 mile we have to divide the value by 69. Listing 3: Find the two nearest tracks to a given point with a maximum distance of 1 kilometer. Lets assume the track information is a JSON document and has the structure shown in listing 4. The corresponding Java object is shown in listing 5. The serializable interface is not necessarily required in this example but maybe you want to use another frontend technology like wicket. Then at least you have to add the interface to your Java object. The next listing 6 shows the Java object position that is used in the Java object track. Listing 6: The position that is used in the track. In this short example the user is not a Java object it’s only a attribute in the track that has a unique identifier. Now we are ready to set up a Spring configuration to use MongoDB. In the first part we introduced the objects we want to store in the MongoDB. Now we need a service to do that for us. Lets have a look at the configuration and implementation of a REST Web service for this example. The Listing 7 shows the configuration that is necessary in the web.xml to get Spring and and our Rest Service going. With that configuration every request that calls an url under the path of /services delegetas to spring. For the servlet mapping with the name services a corresponding file with the nameservices-servlet.xml must be created. In that file nothing has to be configured. The interesting part is the applicationContext.xml file that is placed in the the folder src/main/resources/com/comsysto/labs/mobile/tracks/. Listing 8 show the confiuguration of the applicationContext.xml. This is the base Spring configuration file in this example. Now lets come to the part where everything glues together. Therefore we have a look in our TrackService class shown in Listing 9 in the package org.comsysto.labs.web, where the services are placed which are autodetected by the component scan. Listing 9: The implementation of the TrackService. The context component scan scans for all objects with the @Controller annotation and that is the target of our DispatcherServlet mapped in the web.xml under the path /services. The@RequestMapping(“/track”) maps the whole service under an additional sub-path /track. The annotation at the method getAll @RequestMapping(value = “/get”) maps the Method again. This means to call the getAll Method we have to use the path /services/track/get/. With the attriubte method = RequestMethod.GET we define a Method that is only executed via a get request. The attribute produces = “application/json” defines that the result of the method is JSON. The result is automatically converted from a Java object to JSON by Spring. Therefore shown in listing 10 the Jar file Jackson must be present on the classpath. The other methods are really straight forward and hopefully need not furhter documentation. You may have guessed the app we are building is basically a clone of one of the many sites likeGPSies or bikemap.net where you can share your gps tracks. In the partial source code of the index.html you can easily see, that we have two pages, identified by data-role="page"-Attribute and each contains a header (data-role="header") and adiv for the content (data-role="content"). On our main page with the id="home" we have just a list of links to the other pages. To link to a page, you just need a basic link where the href is a #followed by the id of the page (see lines 7 and 12). If you want to have a special animation for the transition you can simply add a data-transition-Attribute. So now we have the basic html with some links and pages, but now we have to call the rest-service an get the stuff we want to display on the pages.To prepare the content of a page JQuery Mobile offers some events you can listen to. For our use case the page transition events (pagebeforeshow, pageshow, pagehide) and the page creation events (pagecreate and pageinit) are the most important. You should consider carefully what you do on each of the events (we have not done this carefully, so our code might not be perfect :-)). The other parts of the app are build the same way, so simply get the code from GitHub and have a look around. JQuery Mobile is a basic and easy to use framework to create a webapp focused on mobile devices. 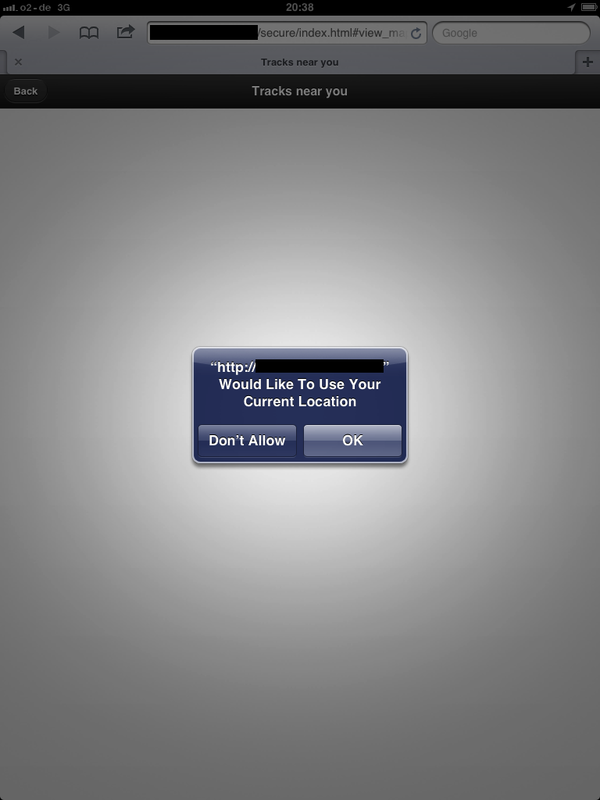 Other frameworks like Sencha Touch may offer some morefunctionality. But I guess next time we should simply use a responsive design approach.